If you’re like most people, you likely spend the majority of your work day sitting behind a desk, in front of a computer. But have you ever thought of standing at your computer instead? 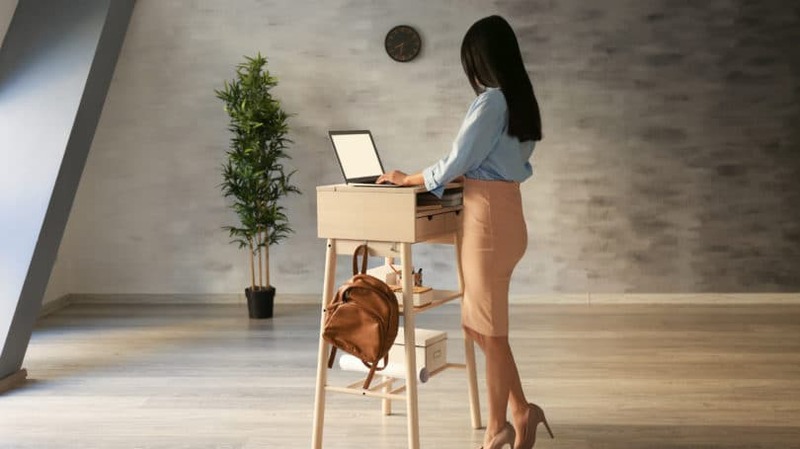 The popularity of standing desks is rising as more people discover the health benefits of standing while they work. And as a computer-bound worker who uses one of these desks myself, I can tell you from experience that the benefits are real. I write at home full-time, which means I used to sit for more than eight hours a day. My health and fitness is a top priority, however, so for several years I’ve used an exercise ball for my chair. Exercise balls help you move constantly throughout the day, and they also help you to burn more calories. However, I recently transitioned to a standing desk. It’s nothing fancy, but the higher work surface keeps me on my feet and moving all day, rather than sitting down. I’ve learned to love it, as has my dog, who spends the day curled up at my feet. I made my standing desk from items I already had around the house. I took an IKEA table I already had and extended the legs as far as they would go. I then put my laptop on a steel box, and suddenly I had a standing desk. The best part is that by the end of the day, I’m pleasantly tired. My body worked all day, even though all I did was write. You may have heard on the news about why sitting is bad for your health. According to recent research, sitting down all day just might be one of the worst things you can do for your physical well-being. However, standing desks help to alleviate this epidemic. Standing desks help you burn more calories throughout the day. According to JustStand.org, I burn an extra 212 calories per day with my standing desk – perhaps even more, since I listen to music while I write and often dance in place while working. The more you move while you stand, the more calories you’re going to burn. JustStand.org has a calculator to determine how many extra calories you could burn with a standing desk. Estimates from various sources state you can burn up to 40% more calories per day with a standing desk, or even as much as 350 calories per every two and a half hours you spend on your feet. Another benefit is that you walk more when utilizing a standing desk. For instance, when I needed a quick break while using a sitting desk, I’d continue to sit and peruse a website for a few minutes. Now when I need a breather, I walk around my office or do a few quick yoga poses. Since I’m already standing, the effort required to move about is minimal. I’ve noticed that since I transitioned to a standing desk, it’s easier to focus on my work. I have more energy throughout the day, and I’ve found that my mind wanders less when I’m standing. Other people I’ve talked to who also use standing desks say the same thing: They focus better when they’re moving all day. Need more convincing? Leonardo da Vinci, Ernest Hemingway, Benjamin Franklin, Winston Churchill, and Thomas Jefferson all stood while they worked. Like anything, there are downsides to a standing desk. You may become really tired when you first make the transition to a standing desk. When I first made the switch, I got tired after a few hours; my body just wasn’t used to standing all day. This is why it’s important to go slow – if you make the transition, start by standing an hour and then sitting an hour, and then go back to standing. If you adjust slowly, your body will become strong enough to stand for much of the day. You might also find that your back hurts or your feet ache after a few hours. You can overcome this, again, by transitioning slowly to standing for longer periods. You should also wear comfortable shoes, and stand on a mat if your desk is on a hard floor. Time Magazine quoted Alan Hedge, the director for Human Factors and Ergonomics at Cornell University, stating that standing all day increases the risks of carotid atherosclerosis (a degenerative disease of the arteries) and varicose veins. Like many things in life, taking a “middle road” is best. While it’s not healthy to sit all day, it’s not healthy to stand all day either. Finding a balance between the two is your best bet. The Varidesk ProDesk Electric is an excellent desk with a quiet motor. It is also available in an assortment of wood colors, including a beautiful reclaimed wood version. It can be assembled in under 5 minutes, it comes with 3 programmable settings, and it can reach an impressive height of 50.5 inches. One of the best perks of this desk is that it ships for free despite the size and weight. The Humanscale Float Desk is handy because you can effortlessly raise and lower the height with the push of a button. This can be beneficial if you need a rest and want to sit. What’s better is that it doesn’t require electricity to function. However, the convenience comes at a cost: The Humanscale Float desk retails for around $1,600. The GeekDesk uses an electric motor to raise and lower the tabletop. While there are several models (and several price ranges), most desks have a wood tabletop and steel legs, differing only in size and finish. So why would you want a standing desk with an electric motor over a model like the Humanscale Float Desk that uses quieter technology? Put simply, price: The GeekDesk retails for less than half of what you’d pay for a Float Desk. Moreover, with the GeekDesk Max, you can preset your heights so that you can simply tap a button and wait for it. The Kangaroo Pro Junior is a desktop configuration. It’s designed to sit on top of your current desk, and elevate your computer so you can stand. Although the Kangaroo is a streamlined configuration, you still must pay $350 or more for the convenience of raising your computer to standing level. The bamboo FluidStance Level is not an actual desk, but it’s an essential component of your standing desk setup. Instead of standing on the ground, the Level provides a stable and comfortable base that also subtly forces you to be in constant movement. The Level is a fantastic way to make sure you don’t get stuck in one position, and it will also force you to burn fat and build muscle while working (without even noticing). 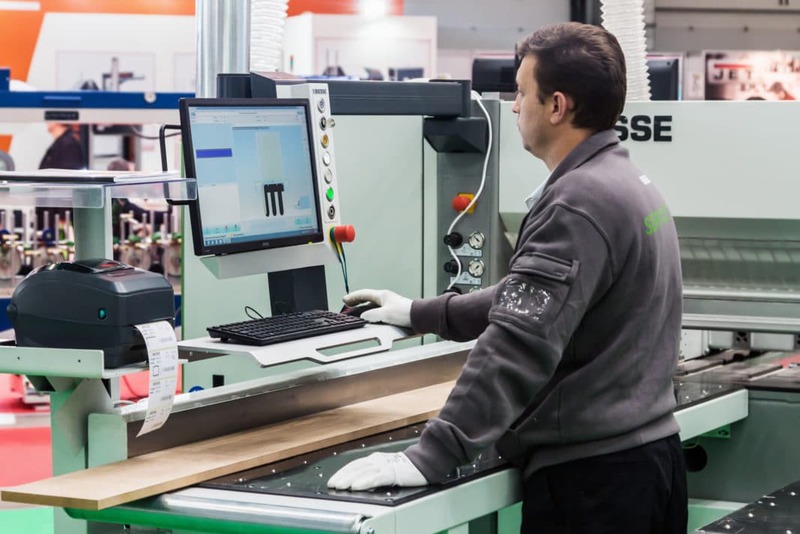 Most adjustable-height desks cost several hundred dollars, and some even run into the thousands. You can, however, make one yourself for a fraction of the cost. If you don’t work at home, check with your employer first to make sure they don’t mind you adjusting your desk. Try raising your computer to standing height by placing it on top of something solid, like books, a box filled with books, or a solid case. Alternatively, you can place solid items of equal height underneath the legs of your desk to raise its overall height. The correct height can vary widely depending on your own height and work preferences. Just keep raising your work surface until you feel comfortable; your elbows should be at a 90-degree angle, and your wrists should not have to bend at all in order to type. Your wrists should not get tired when you’re working – if you feel any strain, you’re at the wrong height. Search the phrase “make a standing desk” to discover a range of instructions and plans for a variety of desks. People have used shelving, pipe fittings, old doors, and milk crates, and have even put chairs on top of their desks to make the conversion. If you make the transition to a standing desk, it’s really important to listen to your body. If you get tired, don’t push yourself to keep standing – if you do, your work will likely suffer. I noticed when I first made the switch that when I got tired, I’d start rushing through my work so I could get done and go sit down. Don’t make that mistake – take it slow, and give your body plenty of time to adjust. Remember, standing all day isn’t a good idea. Find a good balance to avoid unnecessary stress. Have you attempted to use a standing desk? What was the experience like?